The "Hasty Positions Normandy Expansion" brings further depth and exciting gameplay to the world of SMG. Each 3-D terrain piece has integrated modifiers for SHOOT, LOOK, HIDE and MOVE exactly like your terrain tiles, making it easier to defend your areas of the map. Placing your positions to hold key areas of movement or setting up interlocking fields of fire will require the use of different tactics to keep the enemy at bay. Your opponent will have to employ various strategies to attempt to overwhelm your positions. Will he resort to rushing your position with a handful of grenades? Or will he try to set up a fire base and overwhelm you with more firepower? Or will your machine guns pin him down while the artillery you called from your Field Telephone falls on him from overhead. 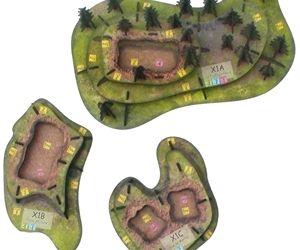 Each of the foxholes comes with it's own set of Story Cards, adding new Story Events for each position, and comes with new Order Cards tasking you to Hold your position . A Field Telephone can even be added to a position to call in off board Mortar or Artillery support to help in your defense. Each piece comes fully illustrated with easy assembly instructions. All of the terrain is made from the same high quality, sturdy material as your SMG maps so you know that you are receiving a highly durable product that can give you years of enjoyment.